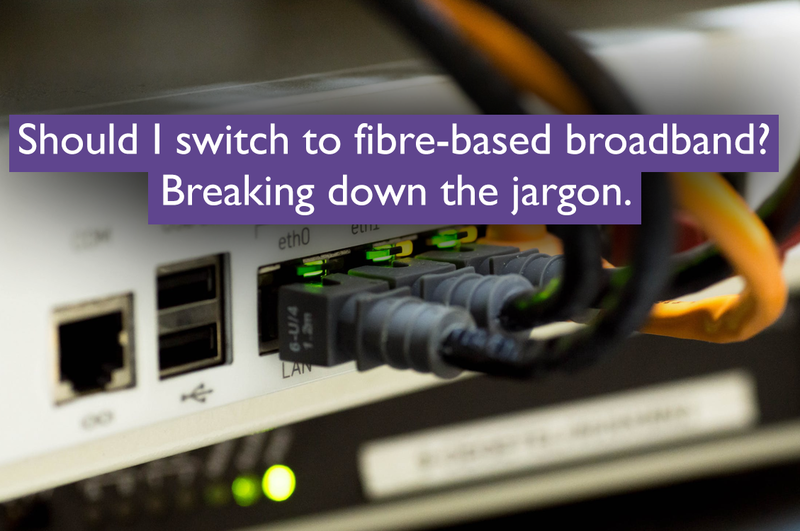 Should I switch to fibre-based broadband? : Breaking down the jargon. Fibre optic broadband uses fibre optic cables to send data. It’s fast, especially compared to traditional ADSL broadband, and gives you a much more reliable connection to boot. With fibre broadband, your connection is generally made up of fibre optic lines up to your local street cabinet, which then connects to your home/office via copper phone lines. A few providers (such as ourselves) offer broadband with fibre lines all the way to your router, though this is less common. ‘Internet speed’ is the speed at which information or data travels from the Web to your device, be it a computer, tablet or smartphone. Internet speed is calculated in megabits per seconds (Mbps) which is the transfer speed. Your download speed will be a bit higher than upload speed. For instance, you might see mentioned in your service provider that “download speeds up to 20 Mbps and uploads up to 4 Mbps.” Don’t confuse Mbps with MBps, aka Megabytes per second. A MB is equal to 8 Megabits combined. Are you considering whether it would be a good idea to go to fibre? It is increasingly available to more people and businesses alike, and the geographic coverage is now superb. The government has dedicated a lot of investment in improving the UK’s fibre infrastructure with the aim of further improving speed and coverage. So here are the questions you should be asking yourself before you commit to this move. What is the difference between fibre and optic broadband? Fibre offers greater speed and bandwidth than a typical ADSL broadband connection, promising faster download speeds, the ability to stream video in higher resolution, and allowing a greater number of users on the same network to enjoy a fast connection so it is perfect for organisations and companies that have a number of devices connected at the same time, and are customer-facing. While the raw numbers quoted might suggest a speed boost of around four or five times, this might not always be the case. Before deciding to upgrade to fibre it is important to check the maximum speed available to you. Still, even if you can’t access the fastest fibre speed, it is still likely to be significantly faster than your existing broadband connection. Fibre-optic cables are immune to interference and do not suffer the signal attenuation experienced by copper lines. This means that the communication, transfer and streaming are interference-free. Does my usage warrant a move to fibre optic broadband? The list can go on forever! 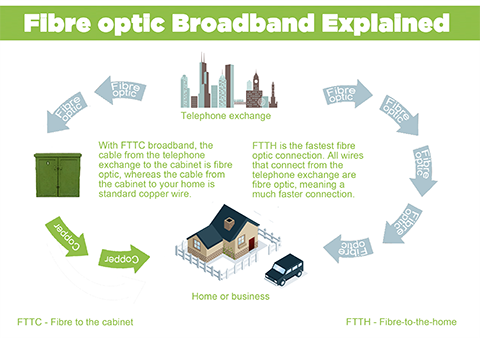 But if you recognise any of the above scenarios, then you would definitely benefit from fibre option broadband. Remember that it would be worth also considering how your usage is likely to change and increase over the next few months. However, if you just use the internet to check emails and do some online shopping, this might not be an investment worth making. Do check out the services that we provide. Our customer service experts and engineers would be happy to have a chat with you about your particular needs, and also confirm that our high-speed fibre option connection is available in your area. You can find out more about our award-winning connectivity services by clicking HERE.